Dental plaque is the major cause of gum disease. Plaque is the build-up of a sticky film of bacteria (germs) and saliva. This collects on the tooth surfaces and in other parts of the mouth. If the plaque is not regularly removed around the necks of the teeth (where the teeth meet the gums), the gums will become inflamed and in a short space of time gingivitis can occur. When it collects around the necks of teeth it causes an inflammatory reaction in the gum. 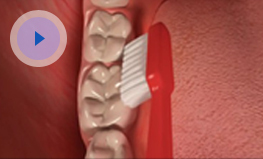 The gum will then swell and this will create a gap (known as a 'pocket') between the tooth and gum. This pocket is more difficult to clean effectively and as a consequence more plaque builds up in the area and the pocket becomes deeper. Left untreated, this cycle can lead to serious long-term problems. Plaque can become hardened (mineralised) and form into a hard surface layer and this is known as tartar (calculus). 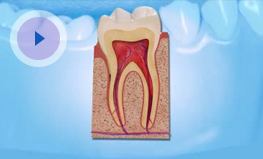 The bacteria present in the tartar continue to attack the tissues that support the tooth roots. In order to prevent plaque and tartar formation it is advisable to brush all tooth surfaces and gum line thoroughly twice a day. Dental plaque can be quite difficult to see, but with the use of disclosing tablets which can be bought at your local pharmacy, the plaque will become coloured and this will therefore make the plaque more visible. If left untreated and the plaque becomes hardened to form calculus, this can result in the destruction of the tooth attachment and the bone around the teeth. This causes the affected tooth or teeth to become loose and may ultimately fall out. If you are experiencing problems, at Dental fx we have three hygienists and a Periodontist who are all highly experienced and skilled and will be delighted to help you restore your teeth and gums to a healthy position.